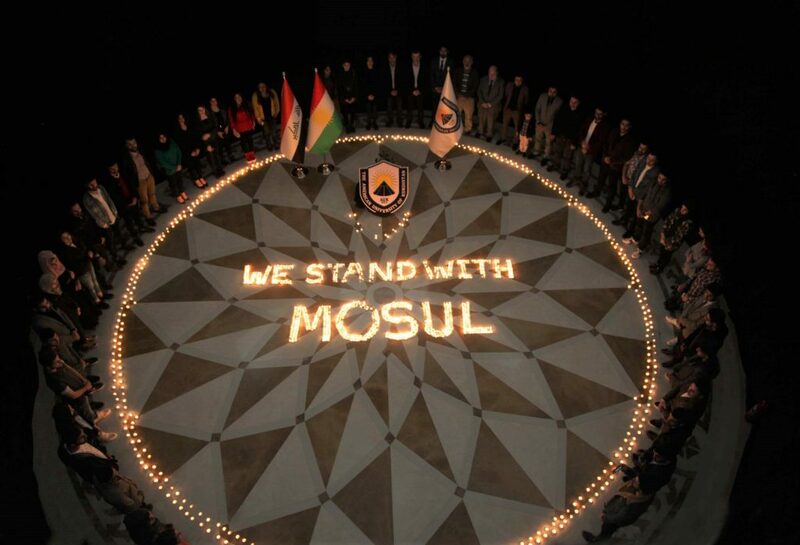 Duhok, Kurdistan Region of Iraq – March 26th, 2019 – The American University of Kurdistan faculty members, staff and students lit candles in commemoration of all the lives that were lost during the capsizing of the ferry in Mosul. On March 21st, an overloaded ferry carrying families on an outing sank in the Tigris river in Mosul in northern Iraq, while most of the casualties on the ferry were women and children who could not swim, as many as 170 to 200 people may have been onboard the ferry. The Tigris River had swelled after heavy rains and video of the incident showed dozens of people struggling in the fast-moving water next to the overturned boat. Iraqi media have reported around 55 people rescued. Up to two thousand candles have been lit in AUK’s Rotunda by students and staff, followed by a moment of silence on the victims’ souls. After the liberation of Mosul from ISIS, the American University of Kurdistan have launched the English Language Institute community in the city of Mosul, in order to help restarting the English language sector there and form a relationship with their people to start their path to excellence with AUK, after their horrific experience. Mosul is a major city in northern Iraq. Located 400 km north of Baghdad, Mosul stands on the west bank of the Tigris, opposite the ancient Assyrian city of Nineveh on the east bank. The metropolitan area has grown to encompass substantial areas on both the “Left Bank” (east side) and the “Right Bank” (west side), as the two banks are described by the locals compared to the flow direction of Tigris.